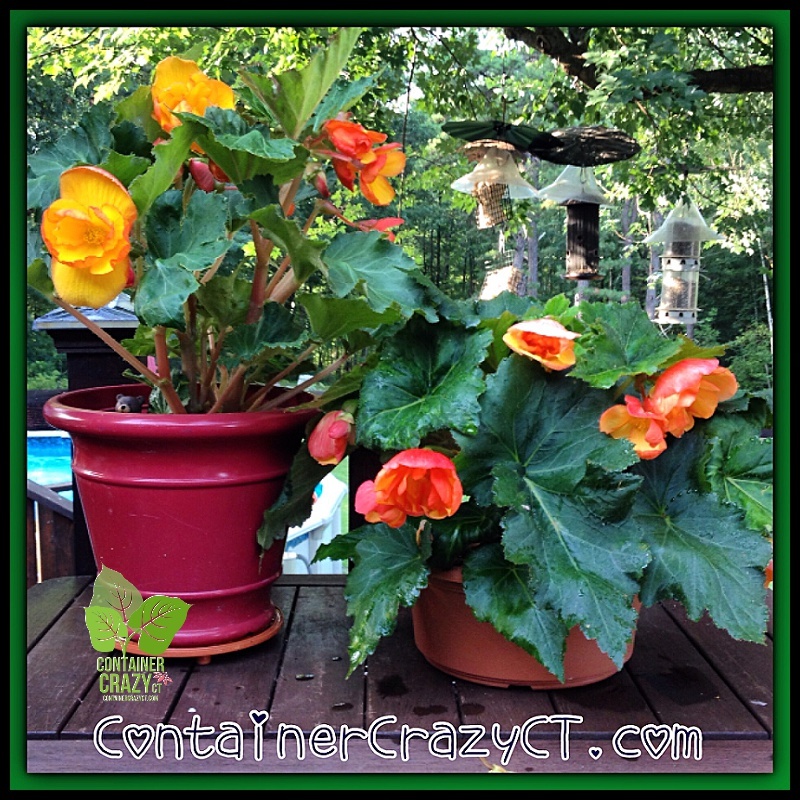 As noted yesterday, I am beginning to disassemble, dismantle, and take apart my container gardens and patio pots. As I do, I will share with you the photos and steps in the event you can not attend my demo on Oct 17th, Saturday. 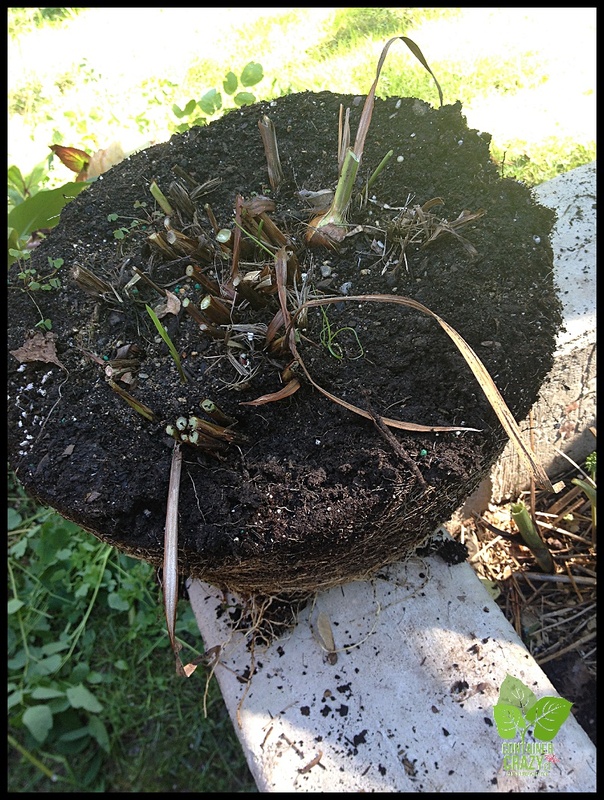 Yesterday, I took apart one pot of Canna plants. I selected the tall red one, figuring it would be easy to show you what I do. 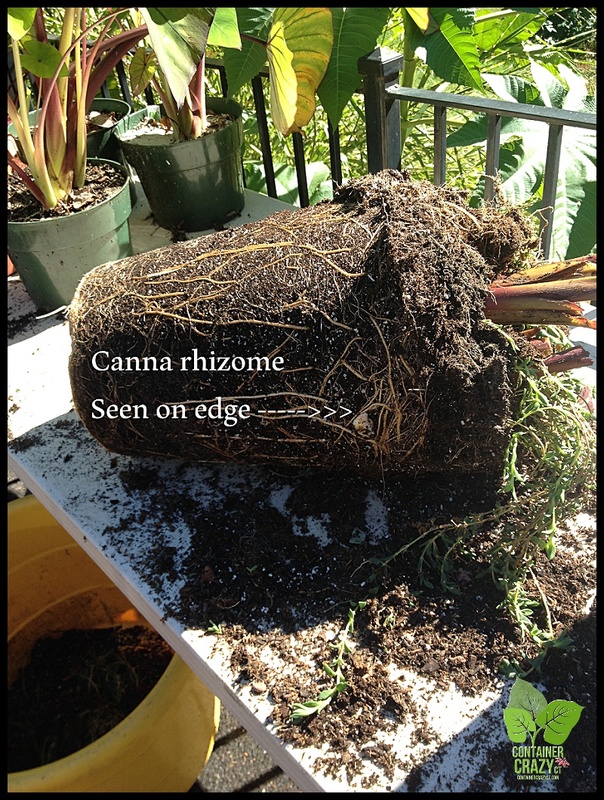 Canna plants may be kept in the pot and stored inside, but today’s post shows you how to store the rhizomes. 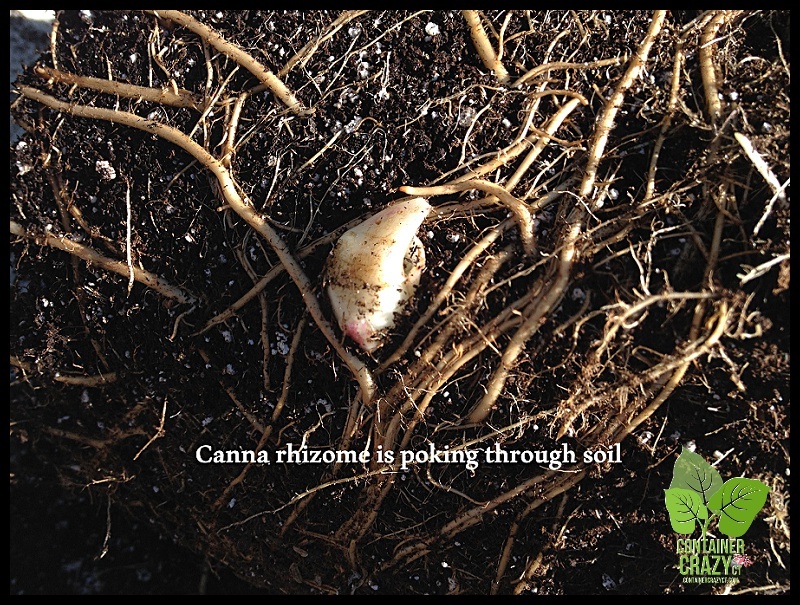 Rhizomes are the storage organs which are swollen stems under the soil that usually grow horizontally, below the soil about 6-8″ from the top of the soil line in the pot. Mature rhizomes may be cut into sections to produce more plants, but you don’t need to do that step now. Just remove them from the soil and store them in peat moss. 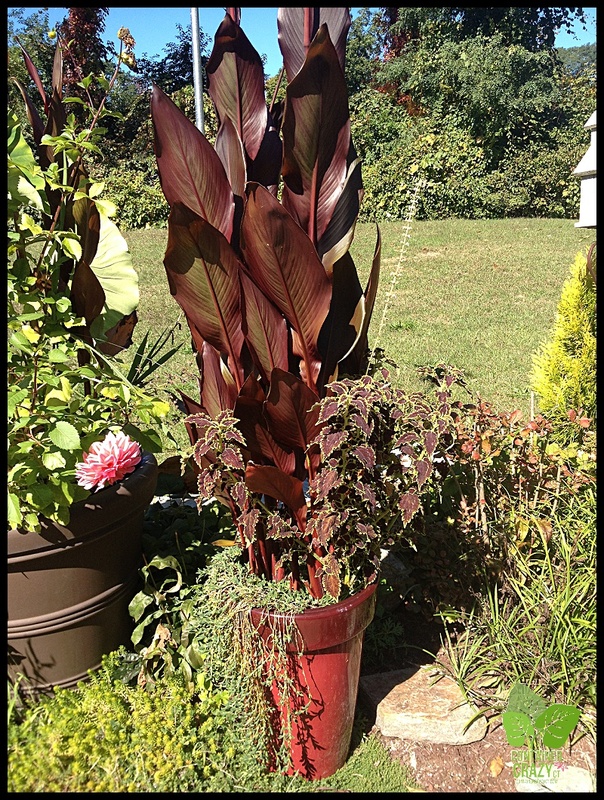 Option #2: If you have a nice sun room in your home, you have the option of continuing to grow your Canna in the pot. However, I find if you keep your Canna plants in the same container for several years in a row, they start to get crowded and tend to not bloom or flourish as much. 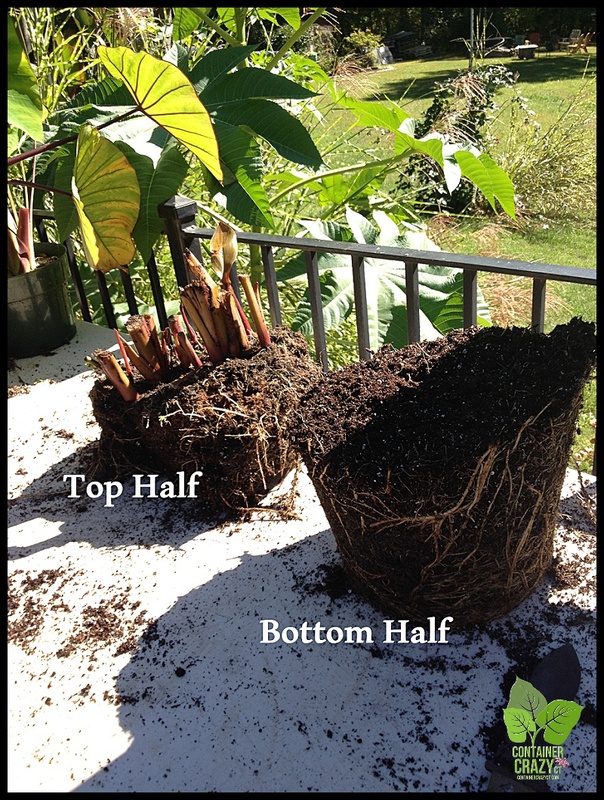 Option #3: A third option is to leave the Canna plants in the pot and move it to an unheated basement where it remains cool all winter, but not below freezing. The plant will go dormant and may be revived the following spring after spring frost. In this case, however, you will need to watch for insects and water it sparingly so the soil does not go completely dry during the winter. Tools: Clean pruners, loppers, or if you are not a full time gardener with various garden tools, use a long kitchen knife (like one you would use to cut bread). When: You may wait until the Canna plants get hit by our fall frost later in October, and many references will say wait until it gets hit by frost. However, I’ve stored rhizomes in fall before frost and all works out fine as well. 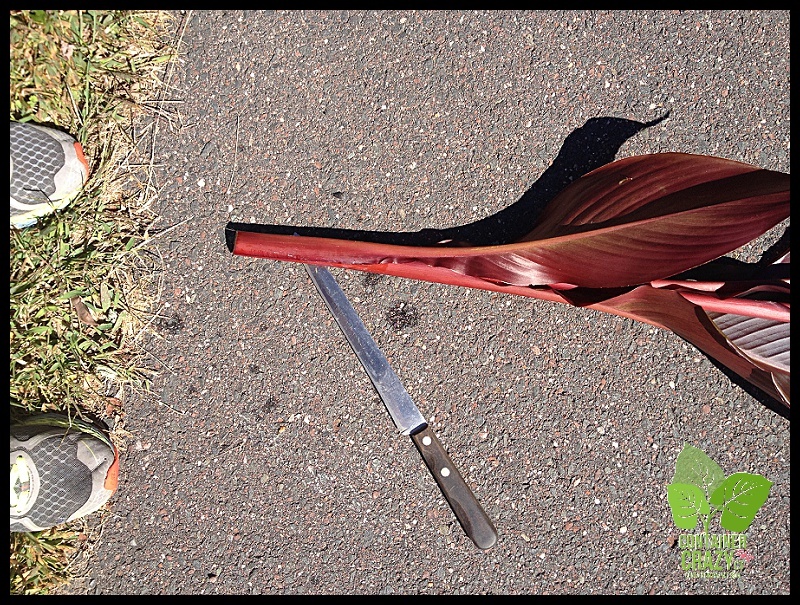 Cleaning: Using sharp, clean tools is important to prevent pests and diseases from being transmitted to your plants or storage organs (rhizomes). It is also a good practice to wear gloves and wash your hands as you work, and wash your pots when you are done dismantling everything. Step One: Cut the stalks at the base, leave a little 5-6″ stub if you want. Most important – make a CLEAN cut. Do not tear, pull, tug or make a jagged like cut – the cleaner cut the better. If the stems are thin, pruners work. If not, I like using loppers for a clean cut. If you use a kitchen knife, remember to make the slice/cut as clean as possible. Step Two: Remove other plants in the pot and save as needed or toss. Then remove the root ball. 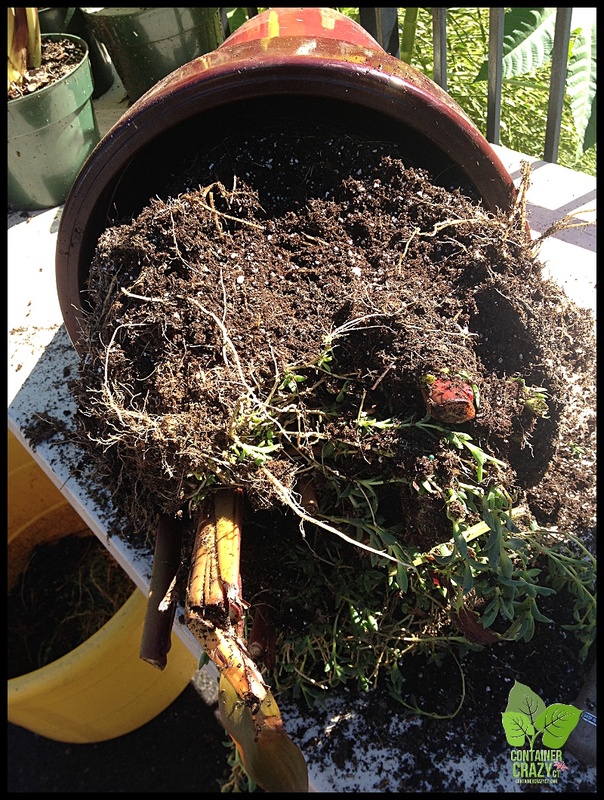 Usually, if the pot does not have a edge on the top rim, it slides out just by turning it over or rolling it on a table (unfortunately, for this red pot, I had to work at removing some soil inside to get it out). You can see a rhizome poking out of the soil here in this photo above. This can help to locate where they are but you will not always see this in every case. Step Three: Cut off (slice off) the bottom half of the soil mass. 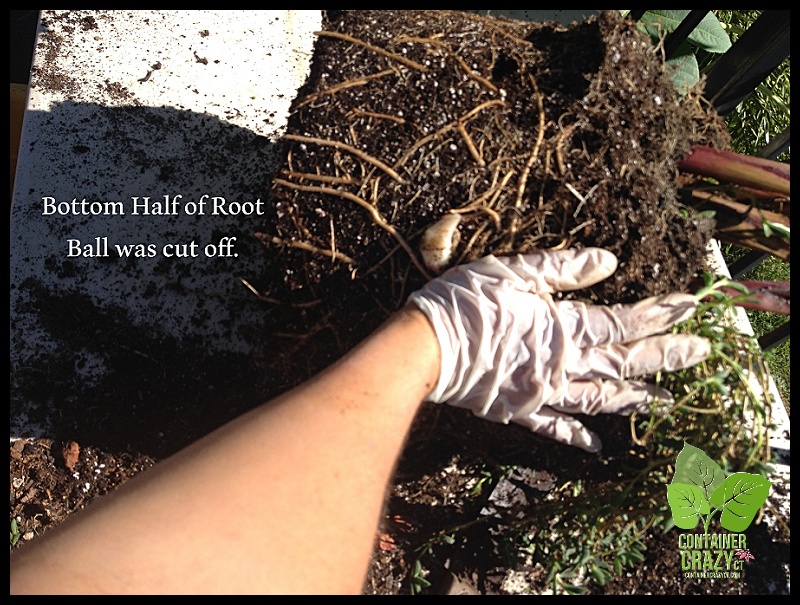 Be careful to not cut the rhizomes which should be about 6-8″ from the top of the soil line. Step Four: I placed my hand to show about the distance from the top of the soil to where the rhizomes are in the soil. 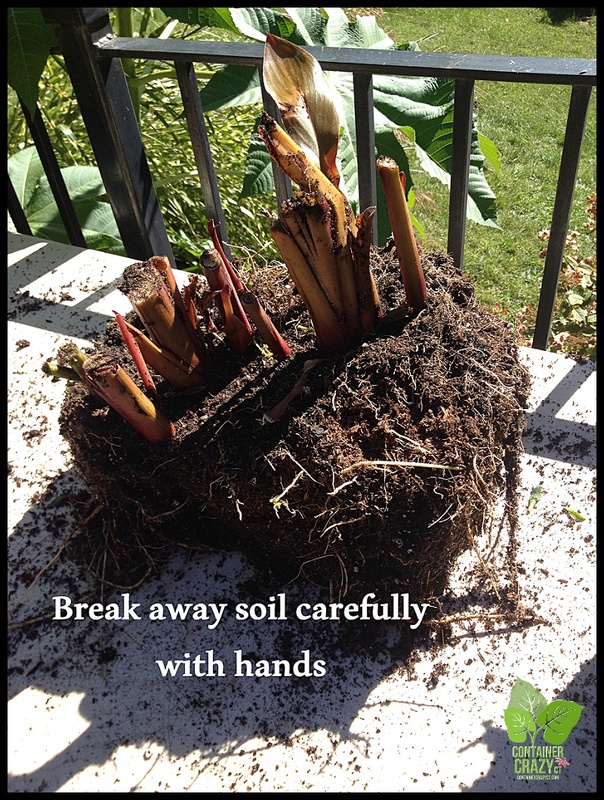 Start to remove the soil away from the rhizomes using your hands or tools. If you use tools, try to not damage the rhizomes accidentally — but if you do – don’t panic. 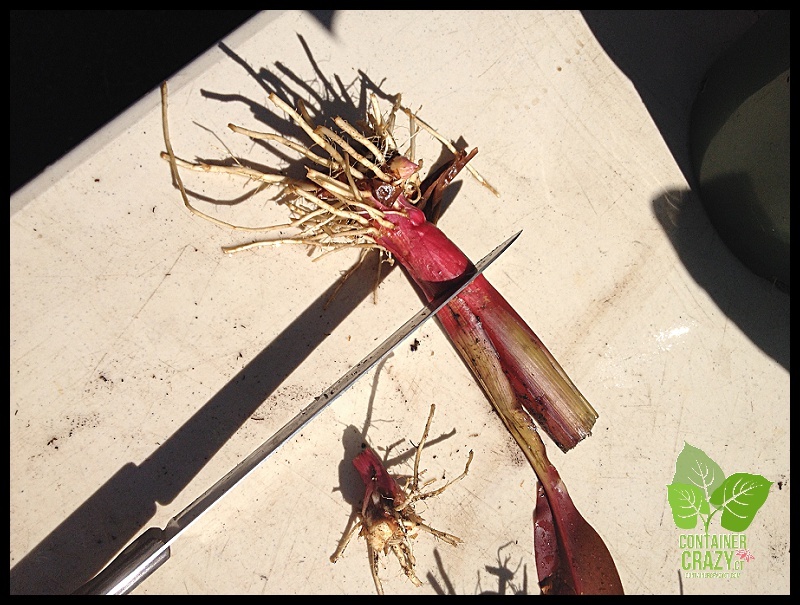 Rhizomes are often cut into sections for propagation, it won’t kill them if you break one by accident. 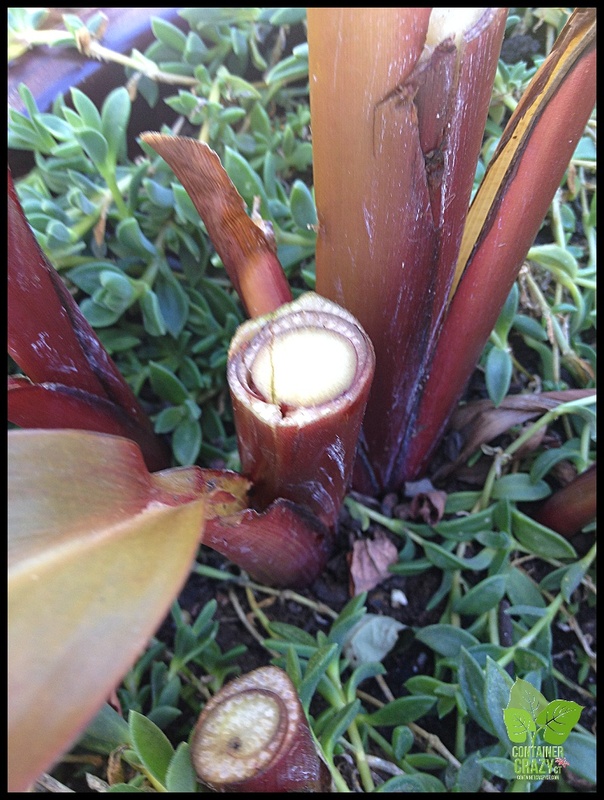 Step Five: Pull the stems a bit apart, they may break away freely, meaning the rhizomes will separate. Take one stem in one hand, and another in the other hand and pull them away from each other, you will see how they break away. Then clean off as much as the soil as you can. You may use a garden hose to wash them off with sprays of water, but I don’t always do this because then the rhizomes get super wet. In this case, I did to show you how they looked. Step Six: Trim off the stem stalks. I do this because any fleshy material stored has the potential to rot in the box of peat moss. 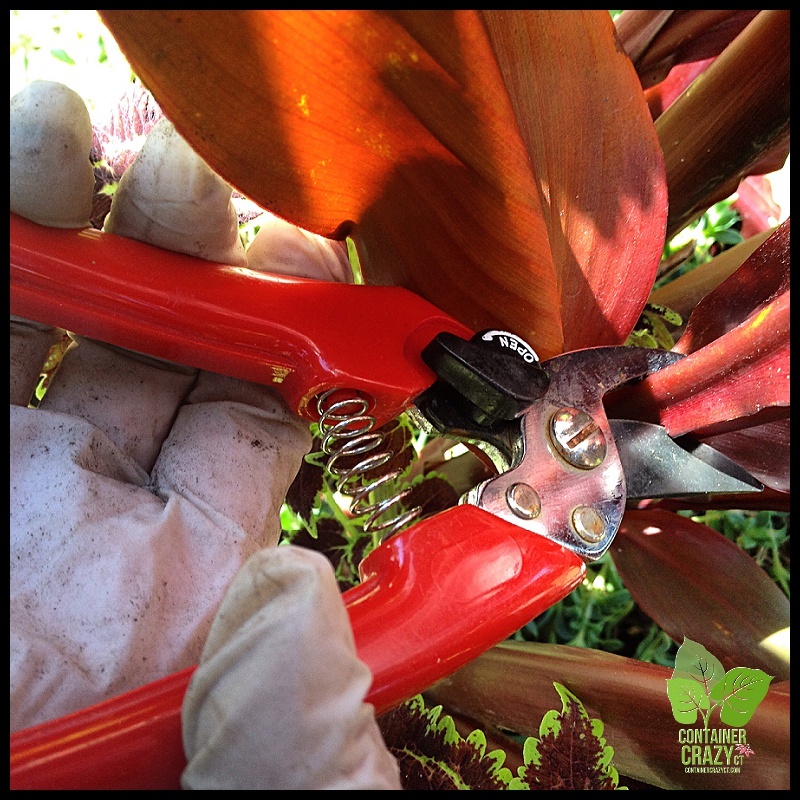 I even trim the roots if they are super long with sharp pruners. Then let them air dry a bit (couple hours). The last step is putting them in a container (box) with peat which I will show in tomorrow’s post. In this particular case, the rhizomes were on the small side, but that doesn’t matter. Each piece you save is another new plant for next year. 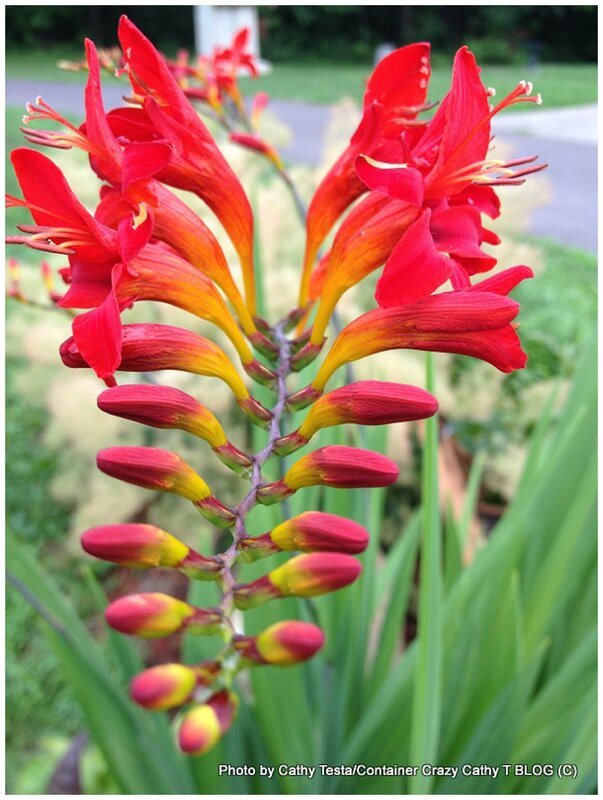 This summer, I put a Croscosmia perennial in a blue pot. The hummingbirds adored this plant’s blooms. It was amazing to see them zip by every day. So, you have choices with perennials too on what to do with them if you grew them in your container gardens and patio pots. They may be removed now and put into the ground to have in your garden or if you have a garage, some perennials will come back if you store the whole pot with the un-removed plant over the winter in the garage. You may also bury pots with perennials in the ground, but I don’t like that idea because the pot will get dirty and probably worn out more – but this is an option. This information was noted on the container garden workshop handouts in May as well (for those attendees reading this information). Before I cut back all the foliage from the Crocosmia perennial, which was tattered by the end of the summer, I collected the seeds from this plant for next season. They may be scattered in your garden or stored for next season. 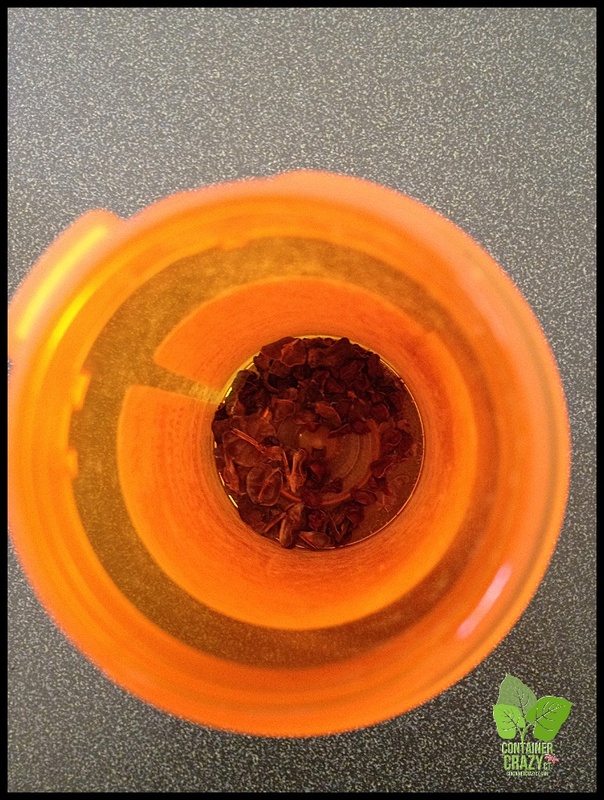 I put seeds in prescription bottles. 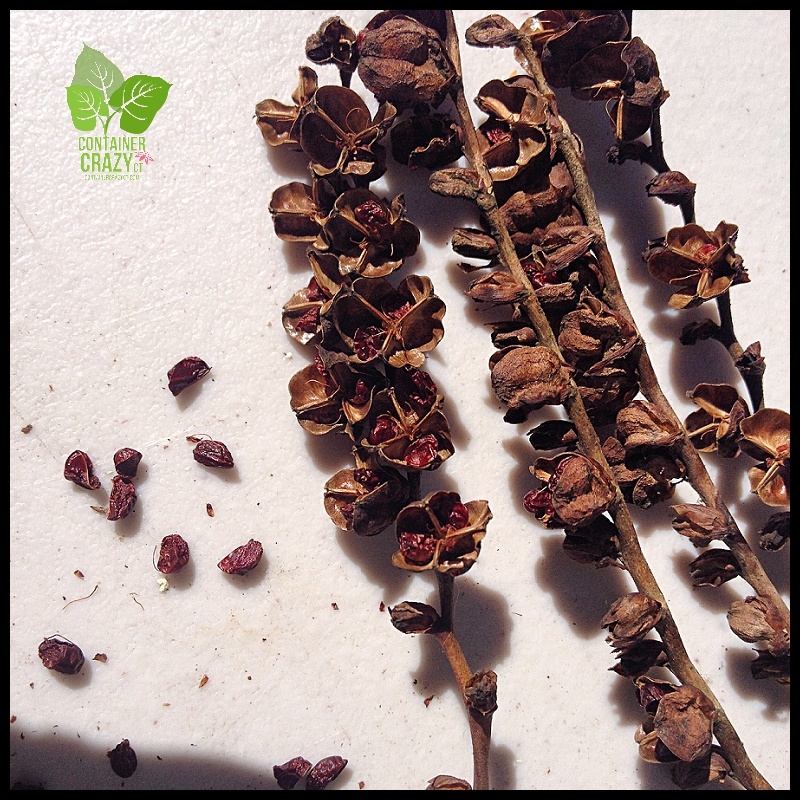 Its a great way to recycle the bottles and the label is available – with a quick sharpie marker, I write the plant’s name and date, and store the seeds in a cool, dark place until next spring. The seeds are stored in pill bottles as shown above. The root ball was removed from the blue pot. 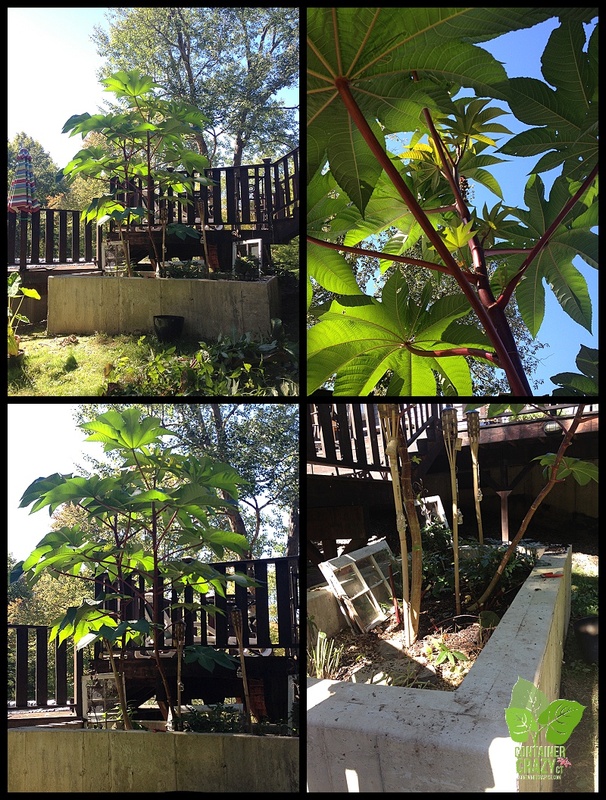 I decided to plant it in my big cement planter after doing a bunch of cutting back of the existing perennials in the cement planter, which also has some huge castor beans growing. 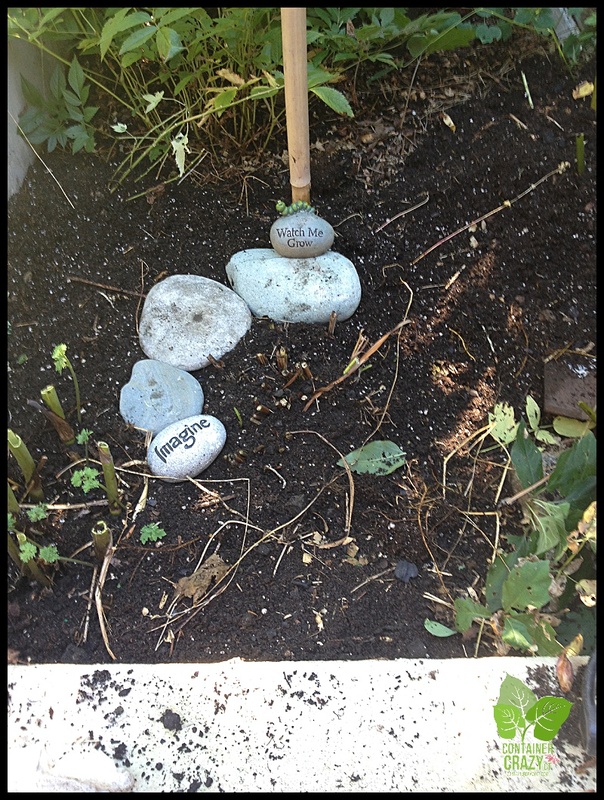 Then I put some stones around the Crocosmia to help me remember I moved it there. Even if I don’t keep it in this spot permanently, it is now saved for next season. I love my big cement planter because the soil is so healthy and easy to work in, and dig in. 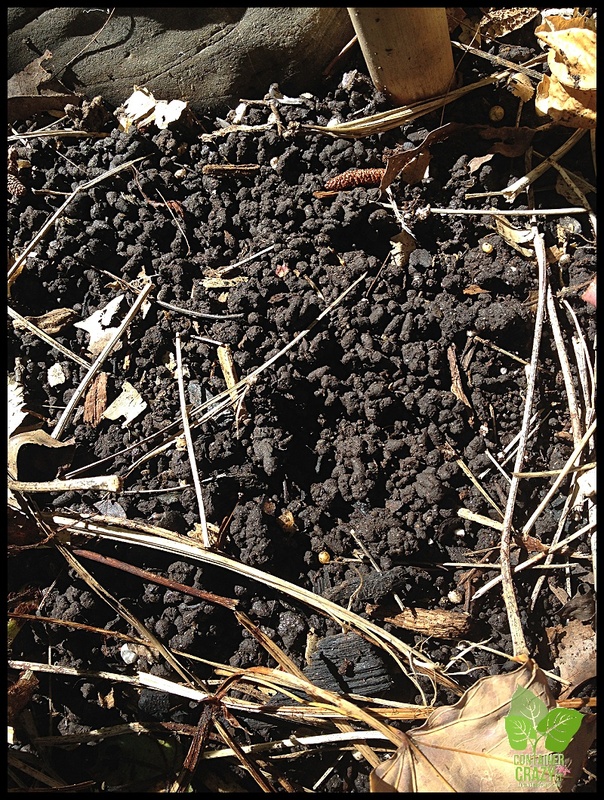 Yesterday, I noticed some worm castings in the soil. This is what they look like below. It a sign the little critters in the soil are doing a great job of keeping the soil healthy. Worms increase air and water movement in the soil and help break down organic matter when they eat, leaving these worm castings behind which help the plant’s growth. As noted in yesterday’s post, I sometimes put old soil balls/masses from dismantled containers into “big” pots or into gardens as a filler in the base – this is one example. The soil in this big cement planter is from former container gardens, and the worms moved in quickly. The soil is rich now. By the way, yesterday I wrote about storing tubers from tuberous Begonias. Here’s a photo of the plant from this summer (see above) which I found this morning in my files. Note: The details about appropriate storing temperature, methods, and specifics by type of plant for overwintering various plants will be covered in the demo session on October 17th. If I were to write all the details here, this would be a very long post – and I’m wordy enough! But this shows you the basics. It is fairly easy to overwinter plants but there are other tips to be learned. You are a god send Cathy! Love it! Thank you Craig. I hope every little bit helps! Visit again soon! Cathy T.
Thank you – I’m glad it is useful and helpful to everyone! Cathy T.